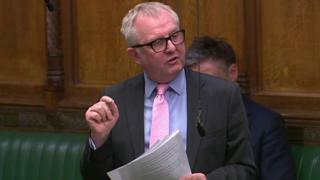 Image caption Independent MP Ian Austin said the move to kick him off the Foreign Affairs Committee was "vindictive". MPs have voted to remove former Labour MPs Ian Austin and Mike Gapes from the Foreign Affairs Select Committee. The motion to remove the independent MPs, who quit their party last month, was put forward by Labour and passed by 199 votes to 134. Mr Austin accused leader Jeremy Corbyn of plotting to boot him off the committee for standing up to racism. A Labour spokesperson said: "It's only right the Labour Party fills its allocation [of committee places]." Labour MPs were instructed to vote for the motion on a three-line whip, while Conservatives were given a free vote. A total of 17 Labour MPs rebelled and voted against their party's motion, while 64 Labour MPs, including Mr Corbyn, abstained. Independent Group MP Mr Gapes said the decision was "a sad day for the independence of select committees". In the debate on the motion before the vote, Mr Austin, who has been a member of the committee since September 2017, said the move to withdraw his membership was "vindictive". He said Mr Corbyn was "utterly unfit" to lead the Labour Party. "One of the reasons I joined Labour as a teenager was to fight racism... now I feel ashamed of it," Mr Austin said. Mr Austin quit the Labour Party last month, blaming Mr Corbyn for "creating a culture of extremism and intolerance" and saying the the leadership had failed to tackle anti-Semitism. He had served as Labour MP for Dudley North since 2005. He said Mr Corbyn "wants to boot me off this committee because I stood up against racism". Image caption Mr Austin said Mr Corbyn "wants to boot me off this committee because I stood up against racism"
Deputy Speaker Lindsay Hoyle interrupted Mr Austin's speech to remind MPs that the debate was about replacing people on the committee, and warned Mr Austin about targeting an individual, Mr Corbyn, who was not present. Independent Group MP Joan Ryan said it was "a day of shame for Parliament", and said the removal of Mr Austin and Mr Gapes had "a personal element". Ms Ryan had earlier called on MPs to express their view on "institutional anti-Semitism" and reject the motion. The two ejected MPs had previously been given unanimous support by the committee to stay, including by its chairman, Conservative MP Tom Tugendhat, who wrote to the whips of both parties urging them not to press ahead. In the debate, Mr Tugendhat praised Mr Austin and Mr Gapes for the "exemplary" way they had conducted themselves on the committee. Image caption Independent MP Joan Ryan said the removal of fellow "TIG" (The Independent Group) MPs was "personal"
Mr Austin and Mr Gapes will be replaced by Labour MPs Conor McGinn and Catherine West. Former Labour MP Chris Leslie, now a member of the Independent Group, will soon face a similar motion to remove him from the International Trade Select Committee. A Labour spokesperson said there were "no plans" to remove fellow Independent Group MP Luciana Berger from the Health and Social Care Committee. Ian Austin: Who is the latest MP to quit Labour?